Helmet Hair is a serious condition. It can ruin expensive blow dries, flatten heavily gelled man spikes, or put daylong dents into painfully straightened hair. It is also the main reason why we choose our car over riding our bike to meet friends for Saturday brunch, or use our scooter to get to work. Helmet Hair is a serious issue. But finally, a solution has been found. 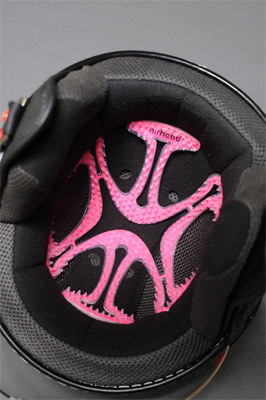 'Airhead' is an Australian designed product that has been specifically engineered to reduce the effects of helmet hair; a condition caused by high humidity within the helmet. This humidity acts like an iron and flattens the hair. 'Airhead' works to increase air ventilation that ultimately reduces perspiration and creates more space for the hair. 'Airhead' has additional advantages to riders. The decrease in perspiration allows for increase in helmet hygiene. The product is removable and can be thrown into the dishwasher for regular cleaning. 'Airhead' is anti-static, anti-bacterial and non-allergenic. 'Airhead' comes in many different colours and styles to suite your mood and lifestyle!